Our ISO partners trust us because we do not compete with them. We do not do merchant processing, so ISOs never have to worry that we will try to take their merchant accounts. We focus exclusively on gift and loyalty so that we do it best! We do all the work for our ISO partners so that they can focus on merchant processing. Our top-notch customer support team promptly returns calls and emails; and provides extensive online and personal ISO and merchant training. Our support is available 24/7. We offer the most competitive pricing available. Our gift card and loyalty programs are scalable for ISO partners and merchants of all sizes. Our pricing enables ISOs and merchants to increase profitability and reduce attrition without much effort on their part. Factor4 is a one stop shop. We provide everything necessary for ISOs and merchants to run successful gift card and loyalty programs. We offer plastic, electronic and mobile cards as well as mobile apps and extensive integrations including Clover, Poynt, iMobile3, POSitouch, Future POS, Revel, Micros, Restaurant Manager, RPower and Adelo. See our complete integrations list here. Our proprietary platform offers extensive reporting capabilities, so merchants can easily track programs. It even enables the ability to push and pull gift card funds for franchises and multi-location merchants. We boast the fastest turn-around in the industry. We set-up merchant accounts promptly. Our quick ship program enables us to print and ship custom cards within 24 hours of order. We have 250K cards, 100K card holders and the largest selection of marketing materials in stock and available to ship immediately. Factor4 is always looking to add new ISO partnerships. 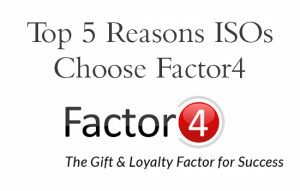 If you would like to learn more about our gift card and loyalty program solutions or our ISO partnership programs, contact Drew Davis at drew@factor4gift.com. Follow us on Facebook, Twitter & LinkedIn for Gift & Loyalty tips. Visit: www.factor4gift.com to learn more.